Provide the data group with a name here. Displays the name of the data group adapter. Displays the list of integrated data fields. Displays the names of the data fields. Displays the data types of the data fields. Opens a dialog where a data field can be defined. Deletes the data field currently selected. 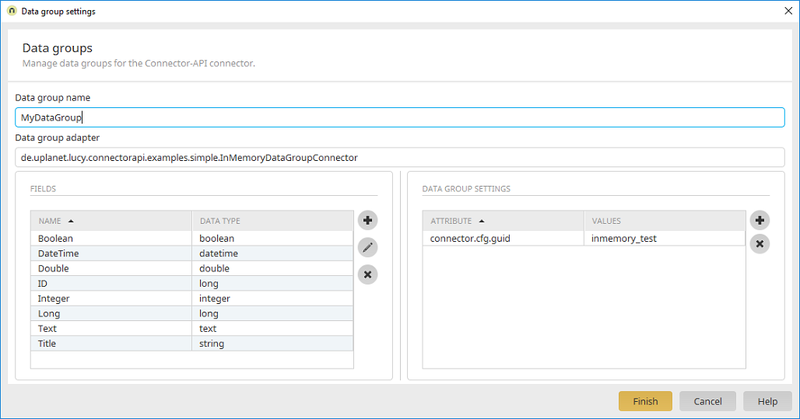 Displays the list of data group settings. Displays the name of the setting. Displays the value of the setting. Adds a new line where a new setting can be defined. Deletes the setting currently selected.